Entirely made out of stainless steel, this wonderful wire White House sculpture will catch eyes and appreciative remarks wherever it is located in the home. For anyone who loves their native city of Washington or indeed their great nation as a whole, this faithful reproduction of the official residence of the American President will make a delightful addition to a home office desk or dining room sideboard. The steel wire White House sculpture is in fact part of an architectural series of famous buildings from around the world. This particular wire model has been faithfully handmade and has all the features one would recognise from the real building. With a few lamps nearby, the wire White House will cast a wonderful array of shadows onto nearby walls and even the ceiling. If you know anyone from Washington DC who is away from home and missing their city, then this sculpture will make the perfect gift. Architectural students will appreciate the craft and skill required to make this model and will even be given inspiration to create their own, if they have not already. I remember from my own days in Art College making model buildings and interiors which were intended to reflect one’s ideas and creativity. 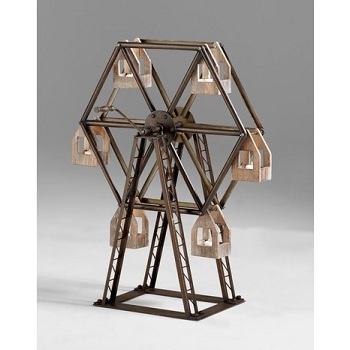 This will also make a super addition to the apartment of an architectural student or someone who appreciates building designs and scale models. 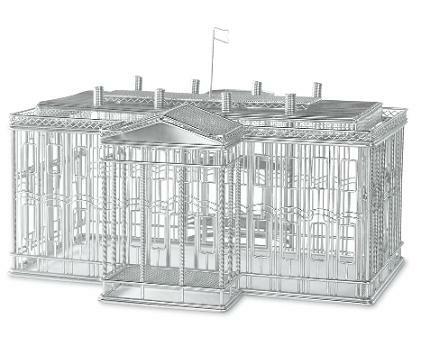 You can buy this sculpture here: Steel Wire White House Sculpture.